Major General Antonio Parlade,Jr., AFP Deputy Chief of Staff for Civil Military Operations, informs the Filipino Community on the Philippine Government’s thrust to end local communist armed conflict in the country within a few years. 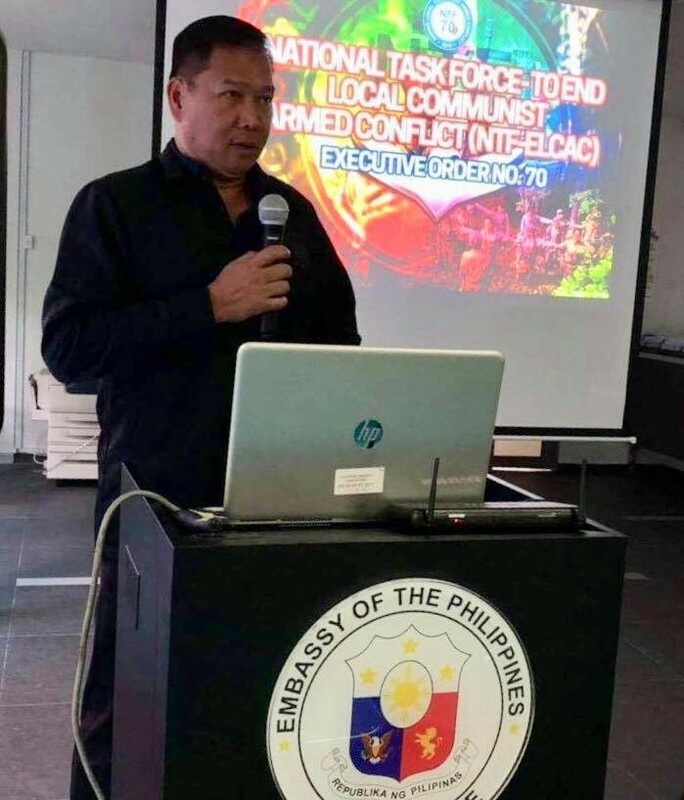 Singapore, 06 April 2019 – Major General Antonio Parlade,Jr., Armed Forces of the Philippines Deputy Chief of Staff for Civil Military Operations, informed the Filipino Community members on the Philippine Government’s thrust to end local communist armed conflict (ECLAC) within a few years. “We are hoping as soon as 2022,” he said. Major General Parlade discussed Executive Order No. 70 which mandates to formulate a National Peace Framework which includes, among others, a mechanism for local peace engagements or negotiations and interventions in order to achieve peace in the country. During the town hall meeting, General Parlade updated the Filipino Community on the progress of the Philippine Government’s action plan to end armed conflict in the Philippines. He said that terrorist-linked organizations sometimes are able to siphon funds from development-and-charitable-oriented programs of NGOs, funded by international organizations. The CPP-NPA receives hundreds of millions of pesos, if not billions, from these diverted funds. The Philippine Government seeks to engage the cooperation of the foreign governments and their law enforcement agencies to end the flow of these diverted funds to the CPP-NPA coffers. General Parlade expressed confidence that the Philippine Armed Forces of the Philippines (AFP) will be able to end the armed conflict by 2023. General Parlade was in Singapore to attend the Military-Police (Milipol) Asia Pacific 2019 Conference on 2-4 April 2019. He was a speaker on the operations of the terrorist and criminal elements as well as the responses to emerging security challenges in the Asia-Pacific region.